The transformative potential of a new carbon material conceived three years ago by two Emirati brothers and an American nuclear scientist may soon be realized with the help of Khalifa University of Science and Technology. In 2014, Mohammed Al Fahim, Rashed Al Fahim and Dr. Larry Burchfield conceived of and designed a new class of carbon allotropes they have named novamene. Novamene combines the molecular structure of two pure forms of carbon – diamond and graphite – producing an allotrope that could possess thermal, electrical and optical properties from its molecular structure that makes it a promising candidate for a range of high-energy electronic applications, including as transistors for faster and smaller computers and as qubits for quantum computing. So far, the work on novamene has been conceptual. In a paper authored by Dr. Burchfield, Mohammed and two others, published earlier this year in the journal Heylion, the unique properties of novamene are identified and described after the team ran a series of advanced computer simulations. But now a team of researchers from Khalifa University of Science and Technology and the University of Milan are working to synthesize the special material in the lab. Dr. Daniel Choi, Associate Professor of Mechanical and Materials Engineering, and Dr. Kin Liao, Professor and Interim Chair of Aerospace Engineering, are leading the team’s research efforts to take the unique molecular structure out of the conceptual realm and turn it into a useful material. Dr. Choi and Dr. Liao bring over 20 years of collective materials synthesis experience to this project. Dr. Choi has experience synthesizing all three different types of carbon allotropes, including graphene, buckminsterfullerene (buckyballs), and carbon nanotubes, for industrial uses, and developing quantum devices with D-Wave Systems for quantum computers, while Dr. Liao similarly has experience fabricating graphene and carbon nanotubes. The pair, with help from researchers at the University of Milan, is experimenting with many different processes to find the most optimal, energy-efficient and affordable way to synthesize novamene. “We are developing different strategies for synthesizing novamene, exploring both top-down and bottom-up approaches to assembling the material. We are also looking at similar fabrication processes used for different carbon allotropes, such as buckyballs, carbon nanotubes and graphene,” Dr. Choi shared. He cannot reveal many details of the process they are developing, as they intend to file a patent on the process that they find is optimal for producing novamene. “We are pioneering new adventures in science and technology that no one has ever thought of before and unlocking the full potential of carbon. It is necessary to team with high-ranking universities, like the Khalifa University of Science and Technology, to help conduct the research required to push our innovative ideas forward,” Dr. Burchfield explained. The arrangement of a molecule’s carbon atoms determines which type, or allotrope, of carbon the molecule is. Graphite, for example, has three bonds between the carbon atoms in its molecules, while diamond’s carbon atoms are connected with four bonds. Novamene is a truly new form of carbon – actually an entire new category of carbon capable of forming hundreds of millions of carbon allotropes due to seemingly infinite amount of possible geometric combinations of its carbon ring core. It combines three-bonded carbon and four-bonded carbon – or graphite and diamond – into one molecular structure. Novamene’s potentially exceptional properties spring from its unique molecular structure, which consists of an electron conducting graphene core surrounded by an insulating outer layer of hexagonal diamond. The caged graphene inside of a protective casing of diamond makes it is chemically inert, or extremely stable. Diamond can withstand high temperatures, and it protects the graphene core and allows the entire structure to withstand high heat loads. But computer simulations have proved the skeptics wrong so far. The simulations have not only demonstrated that novamene is theoretically possible, but that it has the potential to withstand higher temperatures than graphene and has a built-in ‘switching’ capability. ‘Switching,’ or amplifying electric current, is carried out in nearly all of our electronic devices – from mobiles to computers – by silicon-based transistors. “Because novamene has built-in switching capabilities, it can be made smaller than today’s nano-sized silicon transistors, giving it the potential for applications in mobile electronics, computers and many other devices that rely on silicon,” Dr. Burchfield explained. One of the most promising applications of novamene the team is going to explore after it is successfully synthesized is quantum computing. Novamene’s unique graphene core and thermal properties make the material a strong candidate for stabilizing qubits – the fundamental components of quantum computers. Classical computing uses binary digits, with a value of either 0 or 1, and perform calculations through different combinations of the zeros and ones with transistors, which also exist in two binary states – on or off. In quantum computing, a qubit can exist as both 0 and 1 simultaneously through a phenomenon known as superposition. This means that in quantum computing, computations can be done in parallel exponentially faster than in typical computing. A major challenge in quantum computing is finding a material that can maintain the state of superposition with long ‘coherence time’. Coherence time is the length of time during which a quantum superposition state survives. Technically, any property that can take on two or more values, such as the spin of an electron, can be used to process quantum information. Current materials being used as quantum bits can only remain in superposition for a second or less, and at extremely low temperatures of 8 Kelvin, or -265 degrees Celsius. Novamene may be the solution to the superposition conundrum with long coherence time. Its graphene ring core acts as a natural trap for electrons, and at room temperature. Being able to trap and isolate spinning electrons is key to quantum computing, as the more electrons there are, the higher the “noise,” which makes it difficult to define specific states by single electrons. “If there are a couple hundred or thousands of electrons, you cannot find specific energy states corresponding to one or two electrons. That’s why we need to be able to trap a small number of electrons within a specific area,” Dr. Choi explained. The natural trap in novamene’s quantum graphene ring core means the material has the potential to operate as qubits at room temperature, which would be a huge breakthrough for quantum computing, as the energy costs of having to supercool materials is extremely high. The Alfields team has high ambitions for novamene. “We believe that novamene has the potential for changing life on the planet has we know it,” he professed. An entire new classification of carbon allotropes was discovered was in 1985 with the discovery of buckminsterfullerene, or buckyballs. The discovery led to a Nobel Prize in 1996. 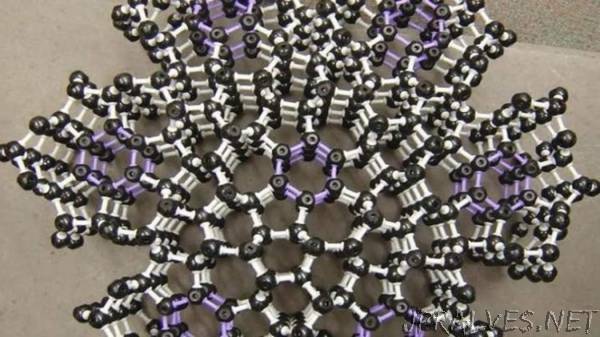 “The discovery of buckyballs opened up a new universe of different types of carbon allotropes to investigate and explore, including carbon nanotubes – the cylindrical cousins of buckyballs – and the development of new fields of advanced materials. Novamene is the only other whole classification of allotropes that has been proposed since fullerenes, and we think it will lead to the same kind of advancements, if not more, in materials science,” Dr. Burchfield said. Many of the world’s major technological challenges may soon be solved with novamene, but first researchers must develop the best way to fabricate the special material so its potential applications can be fulfilled.